A Kubota B5000 gray market tractor. If you have ever done some shopping for a new-to-you compact utility tractor, there is a good chance that you have come across a few gray market tractors in your search. A little extra research will turn up stern warnings detailing the grave dangers of gray market equipment ownership. This article is going to dispel some of the most common misconceptions about Kubota’s gray market models. After reading this article we hope you agree that gray market tractors are not something to be fearful of owning, maintaining, repairing or operating. Gray market Kubotas are not illegal to own. In 1997 it became illegal to import Kubota gray market models into the United States. It is still legal to import gray models into Canada and many other countries. The General Exclusion Order awarded to Kubota by the US courts is to protect Kubota’s business interests in North America. The import ban on gray market models has nothing to do with their lack of reliability, performance or safety. All of Kubota’s gray market models originate from Japan. 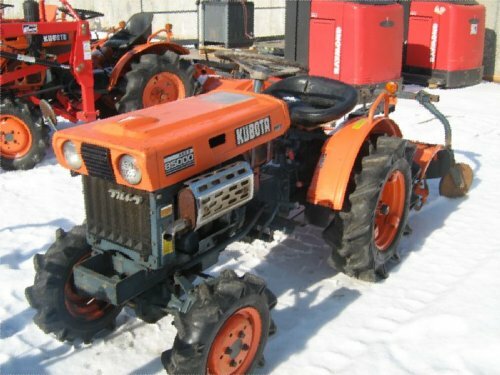 Kubota manufactures tractors in Japan for the Japanese Domestic Market (JDM). You will find that gray market Kubotas have their hood decals, serial plating and operator’s manuals written in Japanese. For examples of Chinese tractors look for a Jinma or Foton. A ZEN-NOH (sometimes spelt Zen-noh or Zennoh) tractor is a Kubota. ZEN-NOH is the world’s largest agricultural cooperative and when you are that important, equipment companies including Kubota, will brand equipment for you. Kubota and ZEN-NOH models travel down the same assembly line – a lot like grocery store branded products versus name branded ones. 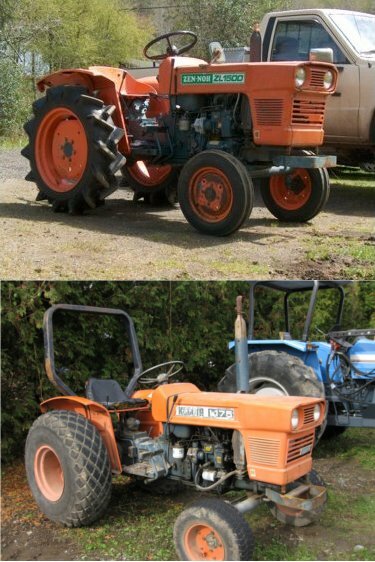 A ZEN-NOH L1500 (top) versus the North American Kubota equivalent, the L175 (bottom). Kubota and ZEN-NOH models drive the same, smell the same, look the same and take the same parts and know-how to repair and maintain. Kubota tractors manufactured for the JDM (read: for Japanese farmers) do not have a Roll Over Protection System (ROPS) or PTO shielding. The reason there is no ROPS is because these gray market models are primarily used for farming rice paddies – miles and miles of flat, flooded land. PTO shielding is not needed because the tractor only ever has a single implement that is never removed – a rototiller. On the assembly line the rototiller is mated to the tractor and it stays that way for its entire useful life in Japan and subsequent export outside of the country. Gray market models are no more or less dangerous than any other tractor that does not have a ROPS or PTO shielding. That being said – it is a good idea to obtain a ROPS and PTO shield if your tractor is not so equipped. Kubota has a ROPS and seat belt program whereby the owner of an older Kubota may obtain a new ROPS and seat belt at cost. This offering is only made available for North American models but the owners of gray market tractors will be happy to know that the parts will fit all the same. You can absolutely obtain replacement parts whether they are made by Kubota themselves or third party aftermarket suppliers. Kubota manufactures tractors for the JDM, North America, South America, Europe, India and a few others – they do not build a different wheel bearing for each market they supply to. The difficulty arises when you contact your North American dealer looking for that same wheel bearing. His parts book will only list the North American applications, likewise, Japanese part suppliers only have parts for their market’s models. A variation on the you cannot get parts myth is that the “counterfeiters” built these gray tractors but never made any of the individual parts available. Nonsense. Both OEM and aftermarket parts are available for a number of gray market models. Filters, waterpumps, alternators, seats, steering wheels, tires, you name it. Since many gray market models have a North American equivalent it is often possible to use the equivalent parts on your own gray model. PTOs typically rotate clockwise. Both the PTO and the implement being driven must turn the same direction. 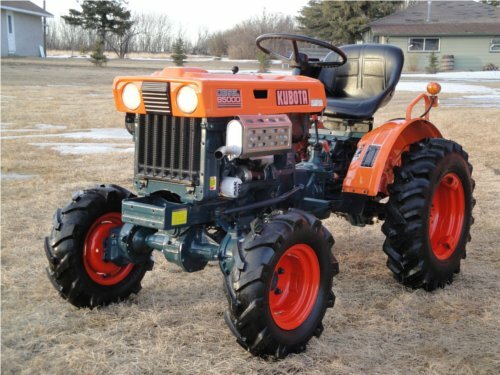 There are only two Japanese tractors where the PTO turns counter-clockwise: the Kubota B6000 and the Mitsubishi Satoh Beaver. So, this myth is only true in the case of the B6000 which is an example of a very early Kubota B-Series model. The business end of a Kubota B6000. This one is a little rusty but it does the trick. As an owner of a Kubota B6000 all is not lost. Hub City has been known to manufacture a PTO reverser that can correct the rotation of your B6000′s PTO. Alternatively, you can be on the look out for implements that are also counter-clockwise and thus compatible. There are a lot of B6000s and associated implements so this is not as difficult as it sounds. The original tires on a gray market Kubota are likely to be rice paddy tires. They have a tread that is 50% deeper and because of the taller tread, a wheel that is smaller so that the total outter diameter is within spec. Replacing the tires generally means replacing both the wheel and the tire. Gray market Kubota B5000 with front and rear rice paddy tires. Also note the factory rototiller attachment. Replacement tires are available and are likely at your local dealership. Tractor owners sometimes switch from ag tires to turf tires or back. That means your local dealership tends to collect spare wheels and tires over the years. Expect to pay $1000-1500 for replacing the rear wheels and tires on the average gray market Kubota. Your local dealer absolutely does know that your ZEN-NOH B6001 is really a B6100. He knows what waterpump fits it, what part number for the air filter and how to service the clutch. He probably has the parts in stock for you. Given the choice, your dealership would very much like to help you. They would like to make those part sales and they would like to see you again when you need a hydraulic oil flush and coolant leak diagnosed. 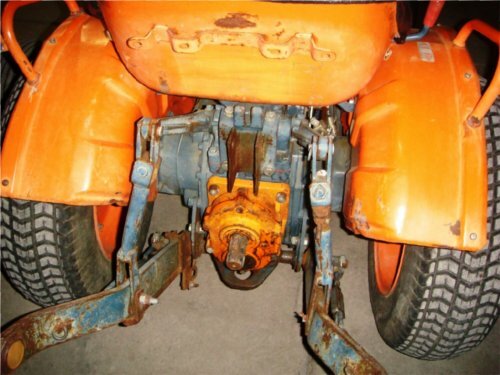 The problem for dealers in the United States is that they are instructed by Kubota corporate to turn away customers that need parts and service on their gray market models. In this regard Kubota has done more to hurt their brand than help. For many, the first experience with a Kubota is a gray market model. When they discover that their dealership is unable or unwilling to support their own equipment it signals to that customer that they are not appreciated. Why would that owner go on to buy another Kubota for their next equipment purchase? Which out-of-touch executive thought of this as the best approach? Shortsighted! Kubota missed an opportunity to buy some goodwill. The right thing to do would have been to take those gray tractors in on trade or at the very least supported owners by offering parts and service. Build a relationship. Strengthen your brand. The import ban came about in 1997. For the last 13 years there are no more gray market models entering the United States. Eventually, the existing gray market models will die out and as they do those owners will likely not return to Kubota. These are not things that are out of the ordinary when it comes to owning and operating a tractor. Owning and operating a gray market Kubota, or any gray market tractor, is really a non-issue. There are sites like OrangeTractorTalks that will help you diagnose your repairs and put you in touch with parts and service vendors. In addition, a lot of gray market tractors have very few hours on them and represent a good value when it comes to making your compact utilty purchase. It would be silly to overlook such good opportunity because of some unfounded rumors.